An absolutely breathtaking, and rather long, hike. It's possible to make it some 45min shorter by taking a bus back from Ganne. After the initial steep climb up to Scimarmota, you are continuously rewarded with incredible views down and across Valle Verzasca and (sometimes at the same time) at Valle Maggia and parts of Lago Maggiore. Additionally you can enjoy great views of three beautiful alpine lakes. The last of them, just below Passo Deva, is right along the path. The other two you can enjoy from above (or you could also decend down to Lago Pianca if you want to extend your hike by another hour or so). If you're fit and want to do a full-day hike in Verzasca, this is the hike I'd recommend. 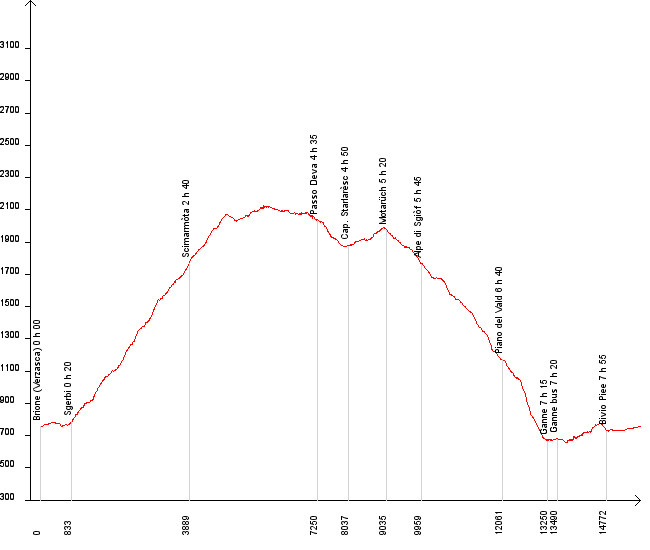 Variations of this hike include going down to Maggia in Maggia Valley instead of heading back to Brione (this shouldn't take much longer) or you can stay in Capanna Starlaresc (just below Passo Deva by the lake) if you wish to divide this hike in half.